CEDAR RAPIDS, Iowa – The 2017 Perfect Game tournament and showcase seasons will officially add their names to the history books when the PG National Underclass Showcase-Main Event in Fort Myers, Fla., concludes its three-day run on Dec. 30. Thousands of high school prospects (grades 9-12) attended those showcases – hundreds of younger players took part in PG Series events – and most of those same players joined travel ball teams that played in the summer and fall after the nation’s high school seasons concluded. They participated in hundreds of Perfect Game World Wood Bat Association (WWBA) – including seven PG World Series – Baseball Championship Series (BCS), Super25, Youth Tournaments and the Perfect Game Baseball Association (PGBA) events. An ever-growing number of teams from across the country competed in PG Super25 state, regional, qualifier, super qualifier and national championship tournaments in eight age-groups in 2017. 10u: Gulf Coast Monarchs (Florida); 11u: Boca Hitmen Ultra 11u (Florida); 12u: Tri-State Arsenal (New Jersey); 13u: East Cobb Astros (Georgia); 14u: IBAHS (Puerto Rico); 15u: PA Playmakers-Kelly (Pennsylvania); 16u: East Cobb Astros 16u (Georgia); 17u: Youse’s Orioles (Maryland). 18u: East Cobb Astros (Georgia); 17u: Canes 17u (Virginia); 16u: Canes National (Virginia); 15u: Team Elite Prime (Ga.); 14u: Academy Select (Texas); 13u: Elite Squad (Florida); 12u: Tri State Arsenal (New Jersey). A closer examination of what several – and certainly not all – of the top travel-ball organizations accomplished in 2017 can be found by clicking here. Major League Baseball worked with Perfect Game to conduct a two-day, 16-team tournament at PG Park South-LakePoint in Emerson, Ga., that would experiment with rules designed to affect a nine-inning game’s pace of play. The Ways to Play powered by MLB & PG was held in mid-October, the weekend before the PG WWBA World Championship in Jupiter, Fla.; all 16 teams also competed in Jupiter. Please click here for the Ways to Play rules as mandated by MLB. While many of the rules seemed extreme – Reagins preferred to call them aggressive – participants and coaches alike seemed to enjoy themselves while completing nine-inning games in less than 2 hours. There were, of course, plenty of adjustments that had to be made. The Georgia-based East Cobb Yankees beat the Virginia-based Canes National, 6-5, in the event’s championship game. The final contest featured 20 hits, which was unexpected because the general feeling all weekend was that the rules gave the pitchers a slight advantage. PG All-American Anthony Seigler, the Canes’ catcher/both-handed pitcher from Cartersville, Ga., was named the MVP after hitting .400 (6-for-15) with a double, triple, home run and four RBI. The whole idea behind putting very talented young prospects inside a baseball test-tube for two days and 32 games was to receive feedback from everyone involved; Reagins expected to get plenty. Fourteen-year-old Blaze Jordan spent the summer and fall of 2017 performing at a level seldom seen in the 14-and-under age-group, and he was recognized for his prowess when he was named the 14u National Player of the Year at the 2nd annual PG Select Baseball Festival in Fort Myers, Fla., over the Labor Day holiday weekend. Although he played in two more PG WWBA tournaments with the Dulin Dodgers after his appearance at the PG Select Baseball Festival, that event provided the most appropriate stage upon which to receive his POY recognition. The No. 1-ranked prospect in the class of 2021, the 6-foot, 215-pound Jordan – a corner-infielder from Southaven, Miss., and a Mississippi State commit – earned all-tournament recognition at 10 PG WWBA tournaments. He was all-tournament as both a batter and a pitcher at the PG WWBA World Championship, the 17u PG WWBA National Championship, the 14u PG WWBA National Championship and the 14u PG World Series, and was the MVP at the 14u PGWS. The slugger hit at least one home run at 17u, 16u, 15u and 14u events this year, including at the PG WWBA World Championship in Jupiter, Fla.
Jordan crushed the competition at the PG Select Baseball Festival Home Run Challenge, slugging four towering home runs over jetBlue Park’s Green Monster in the final round of the competition after launching five bombs in the preliminary round on a jetBlue complex backfield the day before. This year’s PG Select Baseball Festival featured the top 38 14u players from North America playing for either the East or West squads. The game itself was a real pitchers’ battle, with the East finally prevailing, 5-1. Nine East pitchers combined on a nine-inning, 14-strikeout one-hitter; 2020 South Carolina right-hander Alex Edmondson struck out the side in the bottom of the fourth, the only East pitcher to do that in his one inning of work. Nine West pitchers combined on a nine-strikeout, five-hitter with 2021 Alabama righty Grant Taylor striking out the side in his inning of work. Team East needed only five hits to plate its five runs, and 2020 infielder Joel Perez Jr. from Miramar, Fla., had two of them. He singled twice, drove in a run, scored a run stole a base and made a highlight-reel defensive play from third base, and was named the game’s MVP. The players, coaches and their families were honored at an Awards Banquet at the Hyatt Regency Coconut Point Resort & Spa in Bonita Springs the night before the game. Brody Drost (Louisiana), Brady House (Georgia), Cole Wagner (Pennsylvania) and Mario Zabala (Puerto Rico) joined Jordan as the finalists for the 14u National Player of the Year Award. It was also announced at the banquet that the players’ fund-raising efforts brought in more than $23,000 for the Festival’s beneficiary, Golisano Children’s Hospital. The top fund-raisers from each team were the East’s Irving Carter and the West’s Luke Leto. The 2017 PG WWBA Underclass, Sophomore and Freshman World Championships were held consecutively in Fort Myers, Fla., and West Palm Beach, Fla., from Oct. 5-23, and two iconic programs with rich histories of winning PG national championship tournaments won the three titles. Two Pembroke Pines, Fla.-based Elite Squad teams won the championships at both the PG WWBA Underclass World Championship and at the inaugural PG WWBA Sophomore World Championships Oct. 5-9 and Oct. 13-16 in Fort Myers. The Sedalia, N.C.-based Dirtbags won the PG WWBA Freshman World Championship held Oct. 20-23 in West Palm Beach. The Elite Squad with organization president and underclass head coach Richie Palmer survived what PG described as a “baseball marathon” after beating the Sarasota, Fla.-based Florida Burn 2019 Platinum, 4-1, in the championship game at the Underclass World, played at the Lee County Player Development Complex. Both the Squad and the Burn had played 27 innings of playoff baseball in roughly 30 hours just to reach the title game, but still found the energy to put forth Herculean championship game efforts. No. 33-ranked 2020 corner-infielder Gavin Casas was 3-for-3 with a double, triple and three runs scored, and 2020 right-hander Jordan Carrion threw a complete game three-hitter to lead the No. 42-seeded Elite Squad (8-1-0) past the No. 16 Florida Burn 2019 Platinum (8-1-0). Casas, the younger brother of 2017 PG All-American Triston Casas, went 9-for-22 (.409) with three doubles, a triple, a home run and six RBI in the nine games and was named the Most Valuable Player. Elite Squad 2019 right-hander Skylar Gonzalez threw a six-inning, seven-strikeout one-hitter in a semifinal victory. He pitched nine five-hit, shutout innings during the tournament and finished 2-0 with 10 strikeouts; he was named the MV Pitcher. Exactly one week later – this time over at the Terry Park Sports Complex – the Elite Squad and the Florida Burn organizations faced-off again in the championship game of the PG WWBA Sophomore World Championship, this time with their 2020 teams. With a handful of the same players from both teams suited up again for this one, the Squad (6-0-1) once again prevailed over the Burn 2020 Platinum (6-1-0), this time by a dominant 9-0 count. Elite Squad 2020 catcher Kolbe Aven went 9-for-13 (.692) with three doubles and an eye-popping 15 RBI and was named the MVP. The Squad’s 2021 right-hander Alejandro Rosario – the No. 3-ranked overall national prospect in his class – was named the MV Pitcher. The championship game at the 6th annual PG WWBA Freshman World Championship – played at The Ballpark of the Palm Beaches – pitted the Dirtbags against the Fredericksburg, Va.-based Canes Black 2021. Dirtbags 2021 middle-infielder and leadoff hitter Tommy Hawke delivered a walk-off double in the bottom of the seventh inning to lift the ‘Bags (7-0-0) to a 6-5 victory over the Canes (5-1-1) in a memorable, back-and-forth affair. Hawke, a Wake Forest commit from Oak Island, N.C., went 11-for-23 (.478) with four doubles, a triple, four RBI and six stolen bases in the seven games and was named the MV Player. Dirtbags 2021 left-hander Joshua Hartle, another Wake Forest commit from King, N.C., who is ranked No. 34 in his class, threw eight, one-hit, 12-strikeout shutout innings in two appearances and was named the MV Pitcher. Just more than 180 of the top rising high school juniors and sophomores from the classes of 2019 and 2020 came together at jetBlue Park in Fort Myers in mid-June to compete at the 12th annual PG Junior National Showcase, and proceeded to put on quite a show. By the time the event concluded its four-day run, 13 class of 2019 prospects currently ranked in the top-20 nationally – and seven ranked in the top-10 – had performed at a PG Top Prospect List level. The 2020 TPL included 10 players ranked in the top-20, five of whom are also ranked in the top-10. The 2019 TPL was headed by No. 1-ranked Texas shortstop Bobby Witt Jr. Oklahoma commit). He recorded a Pocket Radar ball-off-the-bat exit velocity of 98 mph (1st at the event), threw 91 mph across the infield (tied-3rd) and ran a 6.71-second 60-yard dash (tied-9th) during the showcase’s workout session. He wore his No. 1 national ranking like a badge of honor. No. 3 Florida right-hander Victor Mederos (Miami), No. 4 Minnesota shortstop Mac Horvath (North Carolina), No. 5 Florida outfielder Dylan Crews (LSU), No. 6 Oklahoma right-hander Nate Wohlgemuth and No. 8 North Carolina left-hander Liam Norris (North Carolina) headlined the 2020 TPL. Seventeen pitchers touched 90 mph with their fastball during game-play; four hit 91, two were at 92, two others at 93 and three more touched 94. Charles, Mederos and 2019 No. 13-ranked Florida right-hander Brandon Walker (Florida State) were the three hard-throwers that touched 94 mph. 2019 No. 15 Florida right-hander Matthew Allan (Florida) and Wohlgemuth reached 93, and 2020 No. 12 Alabama righty Jared Kelly and 2019 No. 79 Nebraska right-hander Sam Wibbels (Kentucky) were up to 92 mph. As much of a baseball marathon Championship Day became at the PG WWBA Underclass World Championship in Fort Myers, Championship Day at the PG WWBA World Championship in Jupiter, Fla., two weeks later took it to the next level. And at the end of a roughly nine-hour day of non-stop, high-level and high-energy baseball, it was an underclass team that took home the most prestigious championship trophy in high school-age amateur baseball. The upstart Canes Prospects had to work overtime for a second game on this three-game day, but managed to get past the FTB/SF Giants Scout Team, 8-7 in nine innings, in a game played on Oct. 23 on one of the backfields at the Roger Dean Stadium Complex. The Canes Prospects’ Tucker Flint hit a hard, one-out groundball single into right field that chased home a run in the top of the ninth inning and lifted the young Prospects past the more veteran FTB /SF Giants. It put an end to a back-and-forth, 3½-hour contest that was crazy by any definition. The Prospects were up 4-0 after 2½ innings and 4-3 after three, and the SF Giants enjoyed leads of 5-4 after four and 7-6 after five. The game was tied 7-7 after six innings and it stayed that way until Flint delivered in the top of the ninth. The PG WWBA World Championship title was the fourth in five years for the Virginia-based Canes Baseball organization, and it was captured by one of the youngest teams in the 88-team field. The Canes Prospects boasted a 22-man roster that included 20 2019s (juniors) and two 2020s (sophomores), and what a gritty group it turned out to be. The Prospects started Championship day with a seven-inning victory in the quarterfinals and then needed 11 innings to get past the AZ D-Backs Scout Team, 3-1, in the semifinals. By the end of the day, the Prospects (7-1-0) had played 27 innings in roughly nine hours; the FTB/SF Giants Scout Team (7-1-0) weren’t far behind at 23 innings. The Prospects rattled the FTB/SF Giants’ pitching staff for 14 hits – CJ Rodriguez scored the eventual winning run after smacking a double in front of Flint’s single – and Flint was a key contributor with a 3-for-5 effort, driving in the run and scoring another one. The four pitchers Petty used combined on an eight-hitter with 2019 left-hander Tyler Kehoe picking up the win after working the final four, two-hit, shutout innings. The FTB/SF Giants ST totaled eight hits, led by Riley Greene’s two singles and three RBI and Jarrett Ford’s 2-for-3 effort that included a double, an RBI and a run scored. The Canes’ only loss in the five-day tournament came when they were playing for the Pool L championship against the FTB/SF Giants Scout Team. Yes, the two finalists came out of the same pool with FTB winning the championship because of its 5-3 win over the Canes and the Prospects gaining one of 10 at-large berths into the playoffs. Canes Prospects 2019 top-500 and uncommitted right-hander Dylan Delucia from Port Orange, Fla., pitched 11 2/3 innings over two appearances and gave up only one earned run on nine hits while striking out 17 and walking three; he was named the Most Valuable Pitcher. PG All-American Preston Hartsell, a 6-foot, 195-pound left-handed swinging outfielder and Southern Cal commit from Versailles Newport Coast, Calif., was 1-for-3 with an RBI in the championship game, and finished 8-for-19 (.421) with two doubles, a triple and seven RBI; he was named the tournament’s Most Valuable Player. Canes Baseball is riding an unprecedented high in the nearly 20-year history of the PG WWBA World Championship, and will be expected to return in 2018 with a team favored to win a fifth title. The 2017 PG National Showcase at jetBlue Park in Fort Myers, Fla., will be remembered as the year that “93” became the new normal. Forty-two of the 145 pitchers that had their fastball gunned at 90 miles-per-hour or higher touched at least 93 mph during their outings at the prestigious six-day event in mid-June. Taking it a step further, 22 of those power arms delivered heaters that exceeded 94 mph and six reached 95 or better. Of the six hardest throwers at the National, three are from Georgia and three from Florida, and all are right-handers. Kumar Rocker (Ga., Vanderbilt signee) topped the list at 98 mph; Mason Denaburg (Fla., Florida) touched 97; Slade Cecconi (Fla., Miami) and Ethan Hankins (Ga., Vanderbilt) were at 96, and Levi Kelly (Fla., LSU) and Cole Wilcox (Ga., Georgia) reached 95. All told, 12 of the 22 hurlers that threw 94-plus are from either Florida or Georgia. Even before this year’s National Showcase was in the books, PG National Crosschecker Jheremy Brown was trying to wrap his mind around the numbers. He was practically shaking his head in disbelief after realizing more than 100 pitchers had launched fastballs that reached 92 mph or higher. While pitchers Hankins, left-hander Matthew Liberatore (Ariz., U. of Arizona) and Rocker used strong PG National performances to move into the top-5 of the class of 2018 national prospect rankings at Nos. 1, 3 and 4, respectively, strong showings at the National also helped five position players move into the most recent top-10. They are Florida shortstop Nander De Sedas (No. 2, Florida State), Wisconsin catcher Jarred Kelenic (No. 5, Louisville), Georgia catcher Will Banfield (No. 6, Vanderbilt), Arizona shortstop Nolan Gorman (No. 7, Arizona) and Mississippi outfielder Joe Gray Jr. (No. 10, Ole Miss). 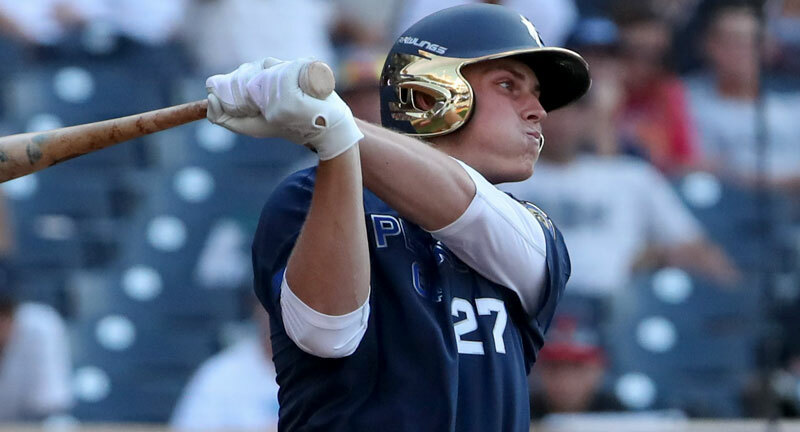 Team West rode the dynamic bat of Arizona slugger Nolan Gorman and the electric arms of nine elite pitchers to claw its way past Team East, 6-1, at this year’s 15th annual Perfect Game All-American Classic in San Diego. The game was played on Aug. 13 at the Padres’ Petco Park, the ninth straight year Petco has hosted the prestigious event. More than 6,100 family members, friends and fans were in attendance in addition to hundreds of MLB scouts and front office personnel; the game was broadcast live on the MLB Network. The West won the elite all-star event for rising high school seniors for the second straight year and for the sixth time in the last seven years, and now holds an all-time series record of 9-6. Gorman, a 6-foot-1 infielder from Glendale, Ariz., who is the No. 7-ranked national prospect in the class of 2018, went 2-for-3 with four RBI and a run scored, a line that included a long two-run home to right-center in the top of the third inning. Gorman was named the Most Valuable Player, an award won in 2016 by Royce Lewis, the No. 1 overall selection in the 2017 MLB June Amateur Draft. Nine West pitchers combined on a 12-strikeout three-hitter. Right-hander Seth Halvorsen from Plymouth, Minn., struck-out all three batters he faced in the bottom of the ninth to pick up the save. Nine East pitchers combined on a five-hitter, striking out 14 West batters. Left-hander Luke Bartnicki out of Marietta, Ga., was one of five East pitchers to strike out two batters but he was the only one that did it in a 1-2-3 inning. Hometown favorite Preston Hartsell from nearby Newport Coast, Calif., won the PGAAC Home Run Challenge, much to the delight of a large gathering of friends and family. The left-handed swinging Hartsell out-slugged Nick Northcut, 9-8, in the finals after launching seven bombs out of Petco in the semifinals. The PG All-American Classic was the culmination of a three-day extravaganza that was highlighted by an historic visit to Rady Children’s Hospital-San Diego. The PG All-Americans had been involved in a months-long fund-raising drive to benefit Rady’s Peckham Center for Cancer and Blood Disorders and their efforts were heralded all weekend. When the players and coaches, along with officials from Perfect Game and Blue Ridge Sports & Entertainment arrived at Rady’s the morning of Aug. 11, it was announced that Team East had raised $30,140 and Team West $28,940. East All-American Triston Casas from Pembroke Pines, Fla., put his team over the top by raising a total of $6,700. Those totals are impressive, to be sure, but the “big picture” numbers are even more so. Since its inception in 2003, the PGAAC has now raised more than $1 million for use in the fight against pediatric cancer, and more than $750,000 has been directed to Rady’s Peckham Center since 2005. The fund-raising efforts were acknowledged in full at the PG All-American Classic Awards Banquet, held the evening of Aug. 12 in a breath-taking outdoor, waterfront setting at the Hilton San Diego Bayfront Hotel. It was also announced at Awards Banquet that Kumar Rocker was the recipient of this year’s Jackie Robinson Award which annually recognizes the PG National High School Player of the Year. A 6-foot-3, 235-pound right-hander from Watkinsville, Ga., Rocker possesses both a 98-mph fastball and a college scholarship to Vanderbilt University. He becomes the 14th recipient of the Jackie Robinson Award, and joins a long list of current or soon-to-be major leaguers, including Justin Upton, Bryce Harper, Lance McCullers and Clint Frazier that won the award previously.